Anyone who pays a visit to the New Hampshire ski areas quickly begins to understand why skiing is the state's official sport. In fact, the "Live Free or Die" state is also known as the birthplace of modern skiing. As such, the ski areas of New Hampshire offer a vast array of options for every taste and budget. One can choose from the modern, upscale resorts, such as Bretton Woods and Attitash, or the more affordable, state-owned, Mount Sunapee. Anyone longing for the classic, old-fashioned style of skiing will enjoy a visit to Wildcat or Black Mountain. If you are traveling with a non-skiing friend, spouse or significant other, he will be pleased to discover that New Hampshire offers some interesting off-slope activities. Bargain hunters visit the outlets of North Conway and there are an ample number of museums, art galleries and spas. While most of the resorts have ski in ski out lodging, a stay at one the state's charming Bed and Breakfasts will truly capture the unique essence of New Hampshire. Unlike the Colorado ski resorts, which are characterized by their great powder skiing, conditions in New Hampshire tend to be icy. For the most part, trails are narrow and winding. If your short radius turn needs improvement, you might want to consider a lesson at one of New Hampshire's many excellent ski schools. 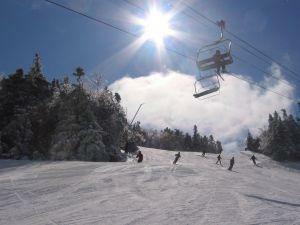 Situated in North Conway, New Hampshire, Mount Cranmore is known for its popular night skiing program. It is also famous for its Saturday night Cranapalooza, which features fireworks, magicians and other types of fun-filled, family-friendly activities. Mount Cranmore also has an interesting history, which began in the summer of 1937. At the time, businessman Harvey Dow Gibson had begun to clear trails for a brand new ski area. Meanwhile, life was not so good for Hans Schneider of Austria. Schneider, creator of the famous Arlberg ski technique, was thrown in jail by Hitler's army. When Gibson heard of Schneider's misfortune, he arranged to have him brought to New Hampshire. As Schneider's train arrived in North Conway, he walked under an archway of ski poles, held up by local ski racers. He eventually became the director of Mount Cranmore's ski school and his techniques and methods of slope grooming are still used today. Meticulously groomed slopes, long beginner slopes and spectacular views of the elegant Mount Washington Hotel characterize the Bretton Woods ski resort. Although its terrain is mellow, it does have its bumps and glades, and its new terrain park has begun to attract more advanced skiers and riders. Bretton Woods is a popular family resort because of their new "kids under 12 ski free" policy. The scenic and romantic ambiance, as well as the night skiing, makes it also a popular dating destination. In 2008, Bretton Woods introduced the Threedom Pass, which allows unlimited skiing at Bretton Woods, Cranmore and Waterville Valley. A company called Peak Resorts recently purchased Attitash. The new owners now offer a season pass, appropriately named the Nor'easter, which allows unlimited skiing at Mount Snow, Crotched Mountain, and Big Boulder in Pennsylvania. Peak Resorts also invested $2.5 million in a state-of-the-art snowmaking system, as well as a mid-station unload to the Abenaki lift. Its two terrain parks, a 500 foot Superpipe and 30 acres of tree-skiing make it a destination choice for advanced skiers and riders. These are just a few of the New Hampshire ski resorts. For a complete list, along with maps and links to resort websites, see Cannon Mountain Ski Area and Gunstock Ski Area, and visit the Ski New Hampshire website.